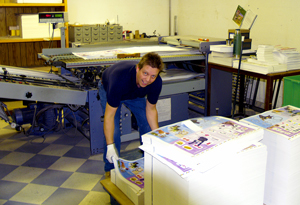 Amos Communications has a wide range of bindery capabilities in-house. These range from 3 ring binder production to laminating to die cutting. This means that a project normally requiring several suppliers can be produced entirely at Amos Communications. This increases our control over the quality of the finished piece, lessens the time required for production and lowers the overall cost of most projects. We are able to produce complicated pieces in house, in less time and with lower risk of failure than most of our competitors.